A driver in her 60s plowed her Mercedes-Benz through three yards, crashed through fences and hit a next-door neighbor who was sunbathing before her car stopped against her own house in Plantation, authorities and neighbors said. The female sunbather was taken to Broward Health Medical Center in serious condition after the crash at 5181 SW 21st Court, Plantation Fire Rescue said. Her health later worsened, so she is now in critical condition. Neighbors identified her as Maya Amitzy Hadad, saying that she is in her late 20s and lives with her husband. 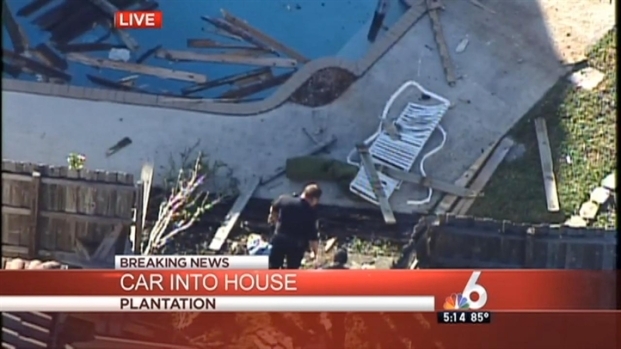 A driver in her 60s apparently plowed her car through three yards, crashed through fences and hit a sunbather before her vehicle stopped against a house in Plantation, authorities said. NBC 6’s Justin Finch reports. Neighbors said the driver of the silver Mercedes was Doreen Hercules. She had minor injuries and was also taken to Broward Health, where her loved ones raced to be by her side. Plantation Fire Rescue said she misnegotiated a turn down the street, then possibly overcompensated as she sped along Southwest 21st Street before crashing into the fences and yards. She bypassed several pools as she plowed through, Plantation Fire Rescue said. Her car ended up inside her screened-in patio alongside a pool it barely missed. 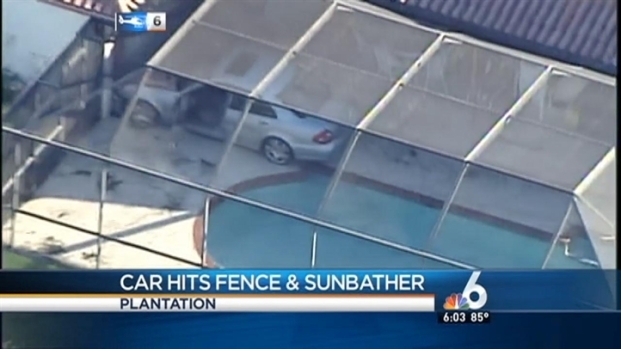 A car crashed through a fence and then hit a sunbather at a Plantation home, authorities said. Aerial footage showed the smashed fence and wreckage. Laurie Stilwell was housesitting for the family of the first yard Hercules struck. "I'm just so happy that they weren't home because they have a little girl, and they're always, always in the pool," she said. 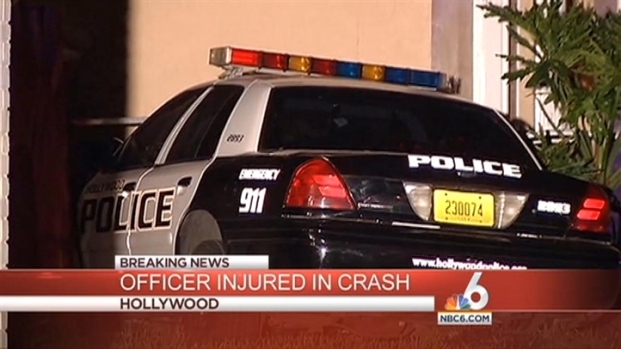 A Hollywood Police officer’s cruiser crashed into a house in a two-car accident that also left the other driver injured Friday night, police said. NBC 6’s Steve Litz reports. Wood planks from one smashed fence were strewn about afterward. A flattened white lounge chair lay on the ground by a pool. Neighbors said Hercules is a nurse who works long hours – and has had accidents on her block before. "She came up on this yard, she hit our mailbox that is over there, and went right into those trees," neighbor Stephanie Turner recalled. "We had a bigger tree, but she knocked it down."